January 2018 saw the passing of South African Jazz legend, Hugh Masekela. The father of South African Jazz. The musician fought a long battle against prostate cancer and passed peacefully in his sleep last week. Hugh Masekela was honoured at a memorial service held in Soweto, which saw hundreds of family, friends and fans whom came to pay tribute to the beloved Bra Hugh Masekela. Many artists around the nation paid tribute and expressed the influence Hugh Masekela’s music had on them. Fans also gathered at the Sankopano Community Centre in Alexandra, where Hugh Masekela’s musical journey started, in celebration of his successful and influential career. Hugh Masekela inspired a nation with his musical talent and it is with great sadness that we say goodbye to the artist, but his success and memory is left behind to further inspire his fans and loved ones. Entertainment-Online.co.za wants to honour this man, who has helped our industry so much. Hugh Masekela was a South African trumpeter, musician and business man. His professional success went beyond his music and inspired a nation with his incredible talent. It is with great sadness that we bid the artist farewell. Hugh Masekela passed away last week surrounded by beloved friends and family, after a long battle against prostate cancer. Fans, friends and family gathered at his memorial in Soweto to pay tribute and their respects as they said goodbye to Hugh Masekela. Several celebrities, fans and friends expressed the influence Hugh Masekela’s music had on them and also gathered at the Sankopano Community Centre in Alexandra, where Hugh Masekela’s musical success started, to honour the musician’s career. The father of South African jazz inspired a nation and will continue to do so even in his passing as his musical talent will be remembered and enjoyed in his success and memory. In saying farewell to the legendary Hugh Masekela, Entertainment Online, as a department, would like to honour this man, who has helped our industry so much. Lady Smith Black Mambazo is a South African Choral group and won their fifth Grammy Award this past weekend. The all-male group took to the internet after winning their fifth award and specially thanked their fans in song for the amazing support. Lady Smith Black Mambazo won a Grammy Award for The Best World Music Album 2017 and made South Africa proud with their authenticity. Congratulations, Ladysmith Black Mambazo. We, at Entertainment-Online, are proud. Lady Smith Black Mambazo made South Africa proud this past weekend when they won a Grammy Award for Best World Music Album 2017. This marks their fifth Grammy Award and took to the internet to thank fans for their support, in song. Entertainment Online congratulates you on your great achievement. It is no secret that South Africa is home to some of the world’s greatest talents. January 2018 has seen a lot of greatness and even some sadness as we both congratulate and say goodbye to some of our best. Legendary music icon, Hugh Masekela, passed away peacefully in his sleep last week, after a long battle against prostate cancer. His memorial, held in Soweto, saw hundreds of friends, family and fans as they paid tribute to Bra Hugh Masekela. People also gathered at the Sankopano Community Centre in Alexandra, where Hugh Masekela’s musical success started, to honour the musician’s career. On the other end, it is with great pleasure that we congratulate Lady Smith Black Mambazo for winning their fifth Grammy Award at the 60th annual Grammy Awards. They won the award for Best World Music Album 2017, and made South Africa proud. The all-male group took to the internet and thanked their fans for the amazing support. On that good news streak, our very own Trevor Noah presented an award at the 2018 Grammy Awards in New York. The comedian took to the stage to announce the winner in the Best Comedy Album Category and made us proud with yet another great achievement. The agency in general is proud. 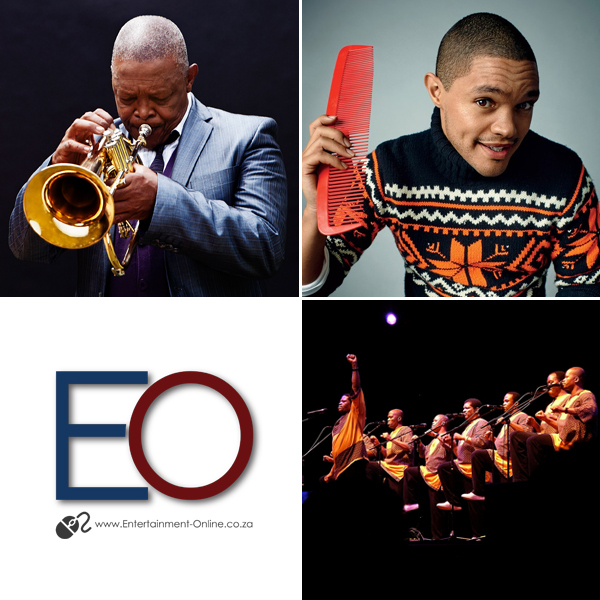 Not only for the fact that we get to book these artists, making clients’ events amazing, but that there are so much great talent in South Africa. We stand strong even on an international platform. Well done, Trevor Noah and Ladysmith Black Mambazo.